Nah! Im sure you dont... too much! Heres the story of two brothers who were fighting with each other even before they were born! It led to much trouble and unhappiness - but then, fighting always does. God heard Isaac's prayer (of course, God hears every prayer! ), and he answered it. When Isaac was 60 years old, Rebekah became pregnant - and not with just one child, but with twins! But before they were even born, Rebekah could feel them kicking and fighting inside her. Why is this happening? she called out. Esau became a strong and skillful hunter who loved the outdoors. Jacob was a quiet man, who preferred to stay home. Isaac like Esau because he liked to eat the wild game Esau brought home from hunting. But Rebekah liked Jacob because he learned to cook and to do other things to help her around the home. One day Esau went out for another one of his hunting trips. He must have been gone for a few days, and the hunting must not have been very good, because when he came back, he was starving for something good to eat. It just so happened that when Esau came home, Jacob had just made a great big pot of hot, steaming, stew. The mouth-watering smell filled the air. Give me some of that red stuff - I am starving! Esau demanded. The Birthright was a very important thing. It went to Esau because he was born first. 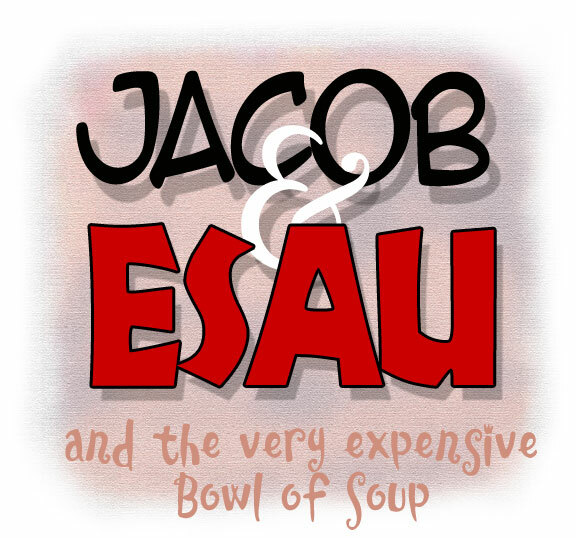 When Isaac died, Esaus Birthright would make him the head of the household, and he would get twice as much of Isaacs wealth as Jacob would. But here is where Esau made his mistake. He didnt care about tomorrow. All that Birthright stuff wouldnt happen for a long time. He knew one day tomorrow would come. If he had the Birthright, one day he would become the head of the household. Give me your Birthright, and I will give you some stew, Jacob said again, as he slurped on a steaming spoonful himself. All right! All right! Esau said, You can have my Birthright. What good will it be to me if I starve to death! Not that he would have starved to death. He was just hungry. Do you promise? Jacob said. All right then, Jacob said, and he gave Esau what he wanted. And so Esau gave away his Birthright for a bowl of soup and few pieces of bread.